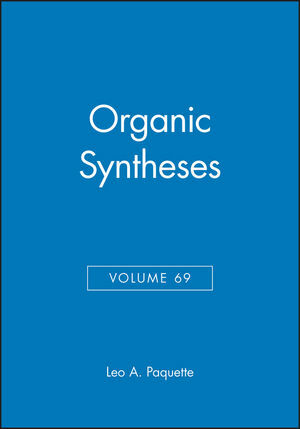 Like its predecessors, this volume contains checked and edited procedures for dealing with important new synthetic methods or specific compounds holding potential interest for synthetic chemists. Among the organic procedures covered are: kinetic resolution by enzymatic means, stereocontrolled processes that have proven useful for constructing relative complex molecules, the vital role that organometallic reagents play in the transformation of functional groups, preparations of starting materials that play an established role in important structural transformation and/or multistep syntheses, the preparation of oxaziridine--a selective, aprotic oxidizing agent of considerable importance, and a chiral auxiliary that has found substantial use in asymmetric reactions of various types. Leo A. Paquette is a professor in the Department of Chemistry at Ohio State University in Columbus, Ohio. He is a distinguished professor; editor and author of a wide list of Wiley publications. Enantiomerically Pure Ethyl (R)- and (S)-2-Fluoro-Hexanoate byEnzyme-Catalyzed Kinetic Resolution (P. Kalaritis & R.Regenye). 1,3,4,6-Tetra-O-Acetyl-2-Deoxy--D-Glucopyranose (B. Giese & K.Groninger). Mixed Higher Order Cyanocuprate-Induced Epoxide Openings:1-Benzyloxy-4-Penten-2-OL (B. Lipshutz, et al.). Hydromagnesiation Reaction of Propargylic Alcohols:(E)-3-Pentyl-2-Nonene-1, 4-Diol from 2-Octyn-1-OL (F. Sato & Y.Kobayashi). N-Fluoropyridinium Triflate: An Electrophilic Fluorinating Agent(T. Umemoto, et al.). Methyl 2-Chloro-2-Cyclo-Propylidenacetate (T. Liese, et al.). Cumulative Author Index for Volumes 65, 66, 67, 68, and 69. Cumulative Subject Index for Volumes 65, 66, 67, 68, and 69.